Kids Club is a place where your kids can grow in their faith in Christ while having lots of fun during the summer. ... GET MY TEENS INVOLVED? Our vision for Next Gen is this: "We want to be a place to belong. A place where students, believing in God and trusting in his word, become passionate disciples of Christ." Our Holy Cross youth ministries are called Next Gen Ministries. At Next Gen, we want your teens to have fun, feel safe, and know that they are valued as part of our community. Our goal is to raise up students so they can become disciples who make disciples; people who follow Jesus Christ, are being formed by Christ, and who seek to fulfill the mission of Christ (Matthew 28: 18-20). To this end, we have weekly Life Groups, monthly Youth Groups, events, and retreats going on throughout the year for both Middle School and High School. You can read more about those by clicking the link below. We hope your child will find Next Gen to be a place to belong! Here are some examples of ways to serve. Sunday worship is an incredible place to give God glory and to help others do the same through music, media, being a layreader or an usher. Our faith formation ministries, life groups, and Next Gen Ministries are places to lead and walk with others in ministry. And finally serving those outside of Holy Cross through Bridge Church, mission trips, and St. Johns Chapel. Opportunities abound. Ready to serve at Holy Cross? Contact the church office (843-883-3586) and we'll help you find the right place. If you are interested in becoming a lay minister click here. ... GET MY KIDS INVOLVED? We love children at Holy Cross and seek to join you — their parents — in supporting their young lives in Christ. 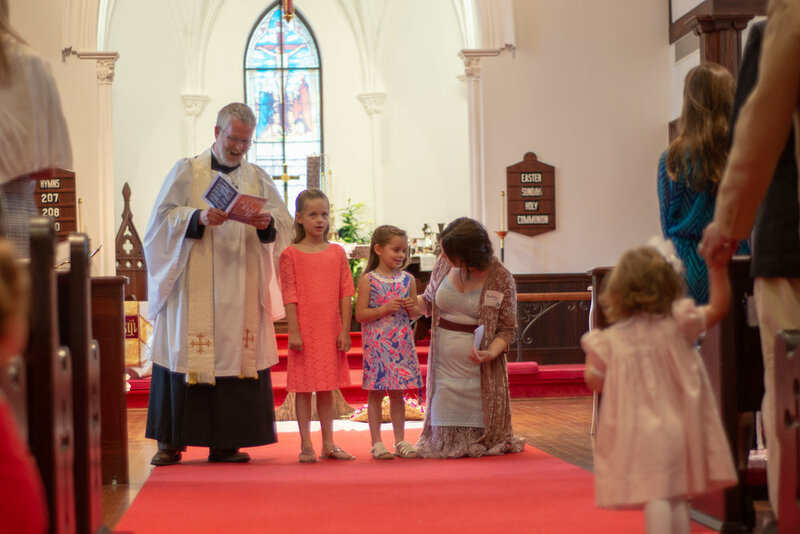 On Sundays and throughout the week at Holy Cross there are a number of growing opportunities for children of all ages (And even a few for their parents, too!) including Life Groups, HIS School and events. The mission of Holy Cross Island School (“HIS School”) is to provide a fun and educational place for children to grow and learn in an environment that teaches and practices the love of Jesus Christ as a ministry of the Church of the Holy Cross. Click here to check out the Holy Cross Island School Website! Holy Cross Kids Club is a morning camp designed to provide your child with fun, faith and friends! Each week features a super cool theme your kids will love plus a corresponding bible story/lesson. We will sing songs together, get silly together (Wacky Wednesdays) and grow our faith together. What’s the purpose of this camp? Our goal is for your child to have FUN while making new friends and growing their faith in Christ Jesus. $200 per child, per week with discounts for registering for all weeks of Kids Club. Registration for 2019 begins on March 1st. Students worshiping and getting ready to play a game of kickball at Camp Next Gen, our yearly summer camp, 2016. Life Groups are the place where relationships flourish, where faith is grown, love is experienced, and ministry is practiced. At Holy Cross, Life Groups are the place where we do life together with other Christians who are learning to know God and each other. A Life Group is typically a gathering of 4 to 12 people that meets weekly in homes to build community and live out the Christian life together. It is led by an intentional leader who meets regularly with a Life Groups Coach from Holy Cross. This ensures mutual accountability and a safe environment to grow for everyone. The purpose of Life Groups is to care for each other and grow as disciples of Jesus. Through studying Scripture, praying for each other, sharing life together and serving others, these small groups provide the context to do just this, and to reach out to our communities. Click on the button below to find out more about Life Groups or get connected with a group in your area of town. The Church of the Holy Cross loves and welcomes new members. Our membership process is designed to help you get the most out of your life as you follow Christ, grow in him, and serve him. Being connected to Jesus and to his family here at Holy Cross begins with becoming plugged in. Our Newcomers’ Dinners help you get to know folks in the church and some of our leadership. Formal Membership begins with Discovering Membership — a Saturday morning course that helps you get to know what Holy Cross believes, how Holy Cross functions, and how you can join us in faith and service. After attending, you can fill out the brief paperwork to officially become a member of Holy Cross. You may also have your membership transferred after the course. Both Newcomers’ Dinners and Discovering Membership are held four times a year. Contact the church office or The Rev. Trevor Spencer to learn more. At Holy Cross, there are multiple ways you can give. Give in person. You can give in person at any campus during the weekend worship service. Give digitally. You can also give digitally - by text, smartphone app, or through the online portal. Go to holycross.net/give for all the details on how to use EasyTithe to respond to God's Grace in your life by supporting our common life and work as the Church of the Holy Cross. Using EasyTithe via app for Android or iOs, you can give once or you can setup recurring gifts. If you would like support the Church of the Holy Cross through giving of stock or making a planned gift, please contact Leslie in our financial office at Leslie@holycross.net.